I've been bitten by the VAM bug. 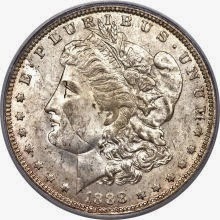 VAM, if you don't already know, is the Morgan dollar variety system devised by Leroy Van Allen and George A. Mallis. There are several books and a large website devoted to identifying die varieties and die states. Many of the varieties are obscure and unimportant to any but the most serious collectors, but some have slipped into the Morgan mainstream and can command astonishing prices. People bitten by the VAM bug could spend a fortune buying these coins, but it is possible to still find very rare and expensive varieties offered at normal prices by people who just do not know. For example, very recently someone reported snatching a 1888-O "scarface" variety from an unknowing Ebay seller. That it's a $10-$20,000 coin is amazing enough, but this particular variety is very easy to spot! This book only covers the important varieties like Scarface, Hotlips and so on. It's vest pocket sized, so it is something you could carry to coin shows or unknowing pawn shops. The picture quality is very good. If I can't have digital, this is as good as it gets. My VAM infection is not too serious. I don't have the financial resources to buy very many Morgans, even if I cherry picked every single one. Fortunately, my interest is only in one year: 1878. That's still a daunting task as there 22 even in the Top 100 list, so I doubt I'll ever complete that set, but it will be fun hunting and this book will help.